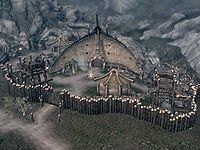 Dushnikh Yal is a prosperous Orc stronghold southeast of Markarth, southwest of Karthspire. Between the stronghold's hunters, Arob and her son Nagrub providing Hogni Red-Arm with the meat that he sells in Markarth's marketplace and Dushnikh Mine, an orichalcum mine, the stronghold is thriving and fairly prosperous. As with all Orc Strongholds, you must become Blood-Kin to the Orcs before you are welcome in the stronghold and able to barter or receive other services. Gharol's Message: Deliver Gharol's sword to Lash. It is a typical Orc stronghold with a wooden palisade surrounding the longhouse and compound, with lookout platforms at regular intervals around the wall and a raised walkway around the inside of the wall. The longhouse is in the center of the compound with the separate activities arranged around it. There are two gates into the stronghold one to the east and the other to the west. On either side of the entrance to the longhouse is a covered seating area for Chief Burguk and a practice dummy used by Ghorbash the Iron Hand for up to twelve hours per day. Murbul spends her time working in an open-fronted hut at an alchemy lab. There is also a tanning rack, and set of shelves holding a random magicka potion, a random healing potion, a bunch of lavender and a thistle branch and three common books, including a copy of The Legend of Red Eagle, which if you haven't already started the quest will initiate it. There are also a garlic braid , two bunches of dried elves ear and a bunch of dried frost mirriam hanging from the roof and a drying frame. Further to the northwest are two more huts that contain another tanning rack with a wooden table, shelves and a food barrel. A pheasant and rabbit are hanging from racks attached to the roof and several sacks of food respectively. Between these and the western gate is a pen for the goat. South of the western gate are ramps passing a tree stump with a growth of Mora Tapinella fungi, leading up behind the longhouse to a decked area with a long wooden table and bench with three common books and a couple of flights of stairs leading up to a small vegetable garden, with a couple of barrels, one of which contains ingredients. South of the eastern gate is a ramp leading up to the blacksmithing area with a large open-fronted hut set behind a forge where Gharol and her son Umurn spend their working day. The hut contains a workbench, a grindstone, a counter and long wooden table with an iron warhammer, a steel greatsword, an iron shield, a random helmet and two orichalcum ingot on top. Just to the south is a smelter. Which is next to another ramp, at the top of which is another tree stump with a mora tapinella fungus growing on it, past this is Dushnikh mine, an orichalcum mine. In the cellar found inside Burguk's Longhouse you can find a unique item; a Dragonfly in a Jar. The cellar also contains a copy of the Heavy Armor skill book Orsinium and the Orcs. Asking Hogni about his meat will add a map marker for the stronghold to your map, if you have not yet discovered it on your own. Sometimes the alchemy lab in the longhouse basement is invisible. It still functions like an alchemy lab, it just cannot be seen. When accepting to brawl with Chief Burguk, the other members may fight you as if you have turned against them. Esta página foi modificada pela última vez à(s) 00h00min de 8 de novembro de 2014.